The SGC stands for 'specialized Goza cutter'. What's a Goza I hear you ask? And this sword is supposedly designed for maximum Goza cutting power. Either way, this thing is a monster of a blade, and while it's heft and intimidating profile will turn many off it, a few will be drawn to it like months to a flame.. It sounds a little bit like the 'SBG Katana' I know. And when I first laid eyes on it, I actually thought it had a bit of 'SBG style' about it: it was big, it was overbuilt and it felt like a monster..
"This THING is a beast!!" Now I tested mine out soon after this series was released in late 2006 - and at the time there were two variants available. 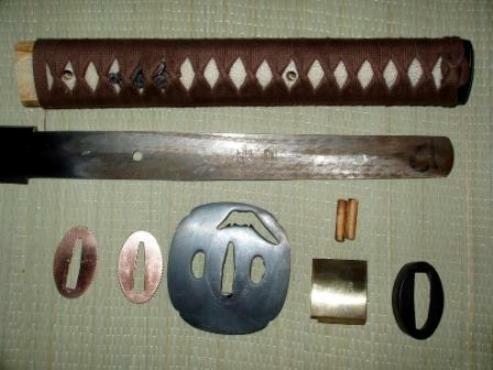 Mine was called the 'Tsukikage' (moon shadow) but was phased out in favor of the Yamakami (山神) - either way the blades were the same, the only difference is in the fittings. Now if you have read any of our other Cheness reviews you will know that fittings are not Cheness Cutleries strong point. They readily admit to this, but naturally a sword is only as strong as it's weakest point, so before we did ANYTHING with this monster of a blade, we had to check the fittings. Because the one I selected was the one discontinued (oh well) here's a pic of the parts dismantled by one of our SBG forumites. It's nothing so fancy, a wider than usual wooden tsuka with brown cotton ito wrap, a blackened steel Mt Fuji tsuba and other standard fittings on a roughly filed, broad full tang. ...Upon removal and after taking off the grease I think the first thought that came to mind was "oh my god what a beast"! So the big question is, just how well does it really cut? Let's look at it from a few different angles and try to answer.. There were two parts to my own cutting tests - the first was to make sure that the SGC could actually do what it was supposed to do - that is cut tatami mats properly. 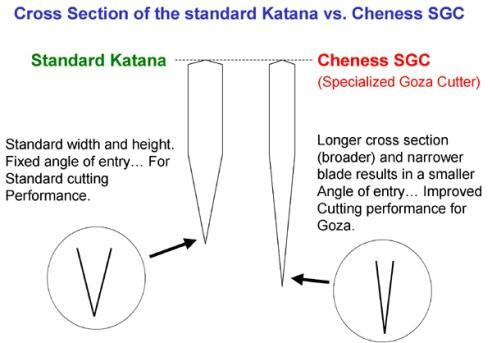 And the second one was to determine if the broader, thinner blade was as STRONG as the other Cheness 9260 Spring Steel Katana. 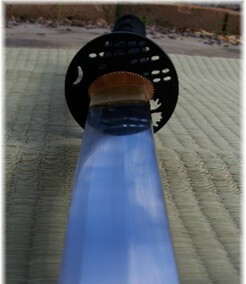 Essentially, the blade profile of the SGC is similar to that of the Practical XL by the Hawei forge, but on steriods. While the XL is quite fast and like a giant scalpel, the SGC is - well, it just feels like a monster of a thing. But while it takes a bit more muscle, in the right hands it's no big deal. The first proof of it's cutting ability was demonstrated by Cheness Cutleries Paul Chen in a backyard cutting video where he cuts single, double and triple mats. The testing video by Cheness Inc with single, double and triple mats. Plus outtakes. My only problem was, I did not have many tatami mats at the time - they are really quite expensive - especially as I was living in Australia at the time, so I did the best I could and rolled a double mat.. It was much bigger than I expected it to be. But this was to be an 'out of the box' test and while the blade felt quite sharp, I didn't know if the blade would make it all the way through. It was, all in all, surprisingly easy to cut.. So far so good. But what about lighter targets like water filled bottles? Accordingly, I set up a few water filled buddy bottles and hung them from the clothes line. As you can see, the first cut was pretty much spot on perfect. The second one went through a little further than I intended, spraying water everywhere and skimming the bottom of the third bottle and slicing it open so that the water started to flow out. And in an attempt to hit it before it was empty, I struck a little too fast  and covered myself and my friend who was filming in water! As I said, not the most graceful blade on the market. But it could cut bottles out of the box with no problem either. As such, there was one final question. Was the narrower blade more fragile than the swords I have tested in previous SBG Cheness Sword Reviews? Time to break out the old 2x4.. It passed the test with flying colors, hacking deep into the wood with no apparent blunting to the blade, chips or other damage. Not something I would want to do with the XL - but that doesn't necessarily make it better. The SGC certainly does cut Goza extremely well - but while it is a beast it still has what it takes to cut light targets like water filled bottles and enough durability to take on a 2x4.. But does it necessarily cut so much better than a normal blade? After all, while not all blades can cut triple mats (most can't - even some of the super expensive ones) the better ones can - and at a certain point you face the law of diminishing returns as beyond 3 mats blade drag is a major factor, and the wider the blade, the more it drags..
All I can say with certainty is that it is BIG, it is MEAN and it is most certainly STRONG. A very interesting addition to any collection and with a massive intimidation factor, but while I like it very much, it probably would not be my first recommendation for a beginner. But if it speaks to you, get it. I'm pretty sure you will like it.. The SCG Katana is available exclusively from the manufacturer and right here SBG Sword Store for $299.